View cart “ProIntro Quotes” has been added to your cart. 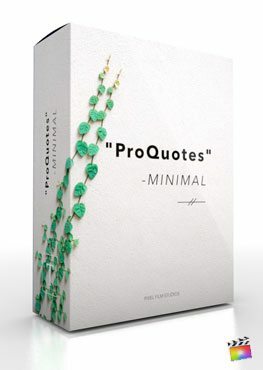 ProQuotes Basics is a set of 30 self-animating quotation presets made exclusively for Final Cut Pro X. This set of quotations features basic lines, boxes, and built-in rotations that allow editors to easily complement a variety of video styles. Use ProQuotes Basics to animate quotes in inspirational and celebratory videos, or use them in a corporate motivational production. Pixel Film Studios makes amazing easy in Final Cut Pro X.
ProQuotes Basics features 30 self-animating presets that are unique, yet versatile across all video styles. Utilize presets with animated lines, boxes, and built-in quotation marks in different orientations. Editors can create altering the text and color of title elements, FCPX users can apply ProQuote’s style to any video productions. ProQuotes Basics features intuitive on-screen controls that allow editors to easily control the overall scale, orientation, and rotation of presets in Final Cut Pro X. Drag the puck around to change the position and turn the handle to angle the title. Lastly, users can click and drag the circle to manipulate sizing. ProQuotes self-animating presets are designed to animate perfectly every time. Presets are defaulted to 6 seconds but can be freely stretched in the Final Cut Pro X timeline without distorting the intro and outro animations. ProQuotes presets may also be shortened, but the user must provide a long enough duration for the sum of the in and out animations. In addition to quotation presets, Basics comes with a modular background tool that allows users to create better contrast between quotations and the media below. To use, simply drag the background tool above your media. From here, users can add a tint or adjust the background blur amount. I installed ProQuotes Basics and see a red screen similar to this. Where do I find ProQuotes Basics? Once the installation is complete, you can find ProQuotes Basics in the FCPX Titles library. Where is the tutorial for ProQuotes Basics?